Ten central agencies have been authorised by the Centre to intercept information from any computer, a move that set off a political storm Friday with the opposition accusing the government of trying to create a ‘surveillance state’. But the Centre said the rules for intercepting and monitoring computer data were framed in 2009 when the Congress-led United Progressive Alliance was in power and its new order only notified the designated authority which can carry out such action. The opposition parties led by the Congress slammed the order as unconstitutional, undemocratic and an assault on fundamental rights and an attempt by the Bharatiya Janata Party-led government to convert India into a ‘surveillance state’ by resorting to ‘snooping’, inviting a sharp response from the ruling party. In a strong defence of the government order, the BJP said it is legal with adequate safeguards and in the interest of national security, dubbing the opposition's criticism as a ‘text book case’ of speaking without any homework. The Centre also rejected the opposition's charge of snooping. Congress chief Rahul Gandhi told Prime Minister Narendra Modi that converting India into ‘police state’ won't solve his problems and it only showed he is an 'insecure dictator'. 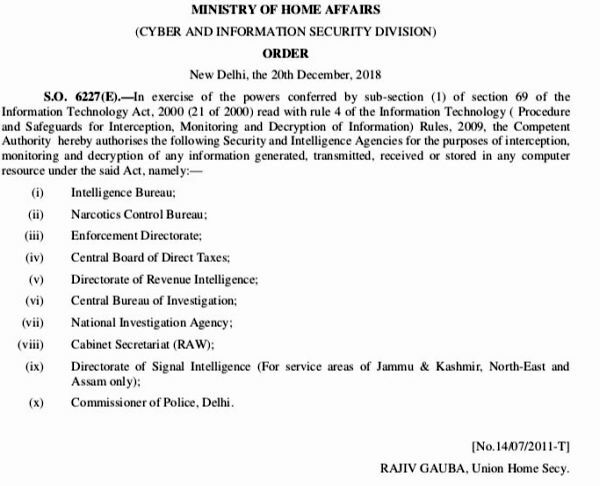 The order that authorised 10 central intelligence, security and tax agencies to intercept, monitor and decrypt all the data contained in ‘any’ computer system was issued Thursday night by the 'cyber and information security' division of the Ministry of Home Affairs(MHA) under the authority of Home Secretary Rajiv Gauba. As a controversy erupted, the MHA issued a statement, saying the order was issued to prevent ‘any unauthorised use of these powers’. The new order ‘does not confer any new powers’ to any security or law enforcement agency, the statement said, adding ‘each case’ of computer interception, monitoring and decryption is ‘to be approved by the competent authority, which is the Union home secretary’. The issue of notification also rocked the Rajya Sabha where Leader of Opposition Ghulam Nabi Azad alleged that ‘undeclared Emergency has taken final shape’ and ‘all federal agencies have been let loose’. Union Finance Minister Arun Jaitley said the authorisation was given under 2009 rules and dismissed opposition's charge of snooping. Jaitley said the Opposition was playing with national security and ‘making a mountain where even a molehill doesn't exist’. Congress leader Anand Sharma said the issue is serious as it is related to fundamental rights and ‘India will become a police state’ with such ‘sweeping powers’ to agencies to intercept information. Responding to the charge, Jaitley said it would have been better if the Opposition had obtained all information before raising this issue. He told the House that the rules under which agencies will be authorised to intercept information were framed in 2009 when the Congress-led UPA was in power. "So what you are doing Mr Anand Sharma is making a mountain where even a molehill does not exist,” he said. However, Azad retorted that there is no mention of national security in the order. "The BJP seems to think it has ownership rights over national security and it means nothing to us," he said taking a swipe at the government." To this, Jaitley said, "These are elementary things. It is an authorisation order. The provisions of national security are written in Article 69.... You are playing with the security of the country. That is what you have done just now". Since the Act has been in place these orders of authorisation are repeated from time to time, he said, adding that they can be used for interception in cases related to national security, disruption of public order, etc. Outside Parliament, Communist Party of India-Marxist chief Sitaram Yehcury said the order was unconstitutional. The BJP government is converting India into a surveillance state through the order, Anand Sharma said with other opposition leaders by his side. "It is the ultimate assault on fundamental rights and the right to privacy. It is also in direct conflict with the Supreme Court judgement that right to privacy is a fundamental right. The government has done it by strength we collectively oppose it," Sharma told reporters. The opposition parties, including the CPI-M, the Samajwadi Party, the Rashtriya Janata Dal and the Trinamool Congress, said they will collectively oppose the order. The BJP government, the opposition leaders said, was converting the country into a surveillance state. ‘From Modi Sarkar to stalker sarkar, clearly the string of losses has left the BJP government desperate for information,’ the Congress said on its official Twitter handle. According to the order, the 10 central probe and snoop agencies are now empowered under the Information Technology (IT) Act for computer interception and analysis. The agencies, according to the order, have been authorised ‘for the purpose of interception, monitoring and decryption of any information generated, transmitted, received or stored in any computer resource under the said Act (section 69 of the IT Act, 2000)’. In the statement, the Home ministry said adequate safeguards are provided in the IT Act, 2000 and similar provisions and procedures already exist in the Telegraph Act along with ‘identical safeguards’. ‘The present notification is analogous to the authorisation issued under the Telegraph Act. The entire process is also subject to a robust review mechanism as in case of Telegraph Act. ‘Every individual case will continue to require prior approval of Home ministry or state government. MHA has not delegated its powers to any law enforcement or security agency,’ it said. The ministry used Rule 4 of the IT (Procedure and Safeguards for Interception, Monitoring and Decryption of Information) Rules 2009 to elaborate its point. 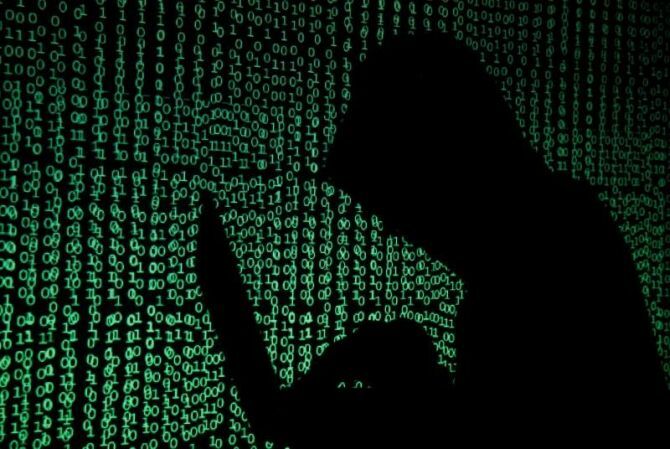 It provides that ‘the competent authority may authorise an agency of the Government to intercept, monitor or decrypt information generated, transmitted, received or stored in any computer resource for the purpose specified in sub-section (1) of Section 69 of the Act’, the ministry said. Therefore, it said, the latest order has been issued ‘in accordance with rules framed in year 2009 and in vogue since then and no new powers have been conferred to any of the security or law enforcement agencies’. Law Minister Ravi Shankar Prasad said the order is legal and the comments by opposition leaders amounted to playing with national security. Prasad said the IT Act, which has provisions for such an interception, was brought by the Congress-led UPA dispensation, and the latest order has only made it more accountable by naming designated agencies which can carry out such an interception. "The UPA had enacted the law. We have made it accountable," he said. Responding to privacy concerns, he told reporters that the government will protect privacy but there can be no compromise with national security. The ministry statement also said the new notification had three benefits. It is aimed at among other things ensuring that any interception, monitoring or decryption of any information through any computer resource is done in accordance with due process of law.